Korean brand Kia has revealed its new Proceed in Barcelona. The original three door sporty variant of the Ceed has been replaced by a new shooting brake design. The rapidly declining three-door hatch segment has made a three door uneconomic but to ease the loss of the sportiest looking Ceed Kia also revealed its smart looking 1.6 litre petrol powered 204hp Ceed GT hatch at the harbour side event. The five door GT hatch has a seven speed double clutch DSG type gearbox and a few sporty bits added on like specific bumpers and alloys. The new Proceed is essentially an extended CEED hatchback that really doesn’t have a rival to go head to head with. It sits on the same platform and has the same wheelbase as the Ceed hatch and sportswagon estate but is positioned as the premium offering in the range. 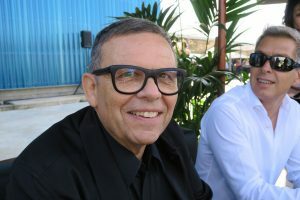 Peter Schreyer, President of Design and Chief Design Officer at Hyundai Kia told me that the classic British shooting break body form that combines style with a degree of practicality was not the first thing the design team thought of as a direct replacement for the three door design. When the bean counters originally told him the Proceed was not an economic proposition a lot of chat was had among his team and numerous body styles were considered as alternatives. In the end the shooting break or shooting brake style (both spellings have been used) won out. The rounded rear of the car is what Proceed is all about and it also features a nice light signature. The boot has all of the cubbyholes and various storage solutions of the lastest Ceed SW estate but just with slightly less space and access due to the style-led tailgate design. Schreyer uses the word fusion to good effect when describing what the Proceed offers. When asked to describe potential buyers the famed designer pointed to the early adopters of SUVs years ago who are not in SUVs today. The five door Proceed will appeal to those types of independent thinkers who want to be a bit different. As for the future of car design Schreyer says the SUV form and the internal combustion engine, albeit with some form of electrafication, will continue to constrain design to a large degree for many years to come. He acknowledges that SUVs are now the mainstream but stresses that there is still a lot of room for designers to deliver exciting machines within the genre. There is a broad range of SUV sub types from genuine off roaders to the soft road crossovers that dominate the sales charts today. He is also excited by the opportunity all electric platforms will give. EVs unique mechanical layout will allow for new interpretation of car design. As for the blurring within the group of Hyundai and Kia product Schreyer with a smile in his eyes stresses that Kia will always be the more architectural one in the group with an emphasis on dynamic purity, in other words the junior partner’s machines will feature less fussy designs. Despite being group design head the man still has a soft spot for the brand he first joined after his time at Audi. Kia’s European Head of Design Gregory Guillaumeaid pointed out that no one at Kia is throwing out traditional car design as we cannot simply ignore over 100 years of history. Changes to design will continue to evolve and the challenge is to decide on what exactly to change. The overall message from Kia was the Proceed is an emotional product but very much part of the European built and sold Ceed family. It will offer buyers a greater connection with the vastly improved new generation Ceed. The Kia Proceed will arrive in early 2019 after the introduction of the Kia Niro EV.